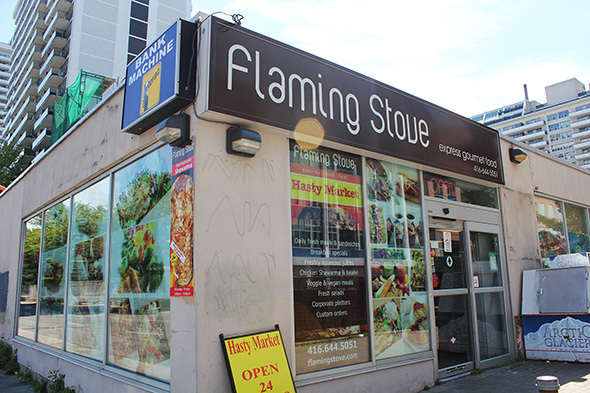 The Flaming Stove is an unassuming local haunt that's tucked into the back of a Hasty Mart near the corner of Davisville and Yonge Street. 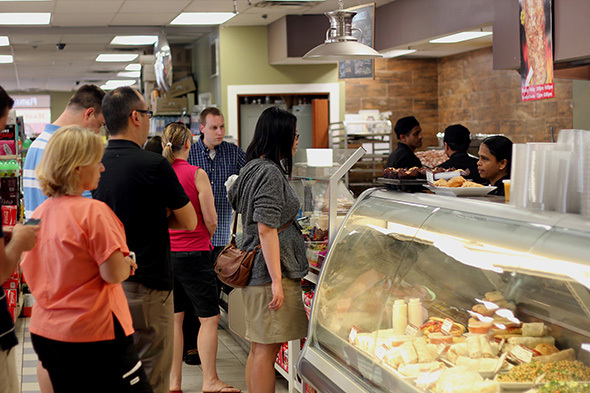 A hidden gem for lunchtime specials, local office-dwellers flock to the back of this convenience store for their daily assortment of fresh sandwiches, salads, samosas, and fruit juices. Owner Costa Warwar is about as passionate as they come - humbly boasting about the fresh olive oils, vegetables and meats he uses for his cooking. 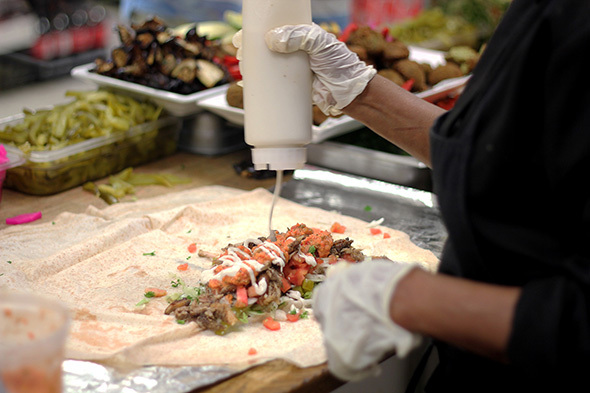 His Middle Eastern background and his love for great shawarma see swarms of Midtowners queuing up for these special sandwiches every Friday afternoon. Having become so popular around the neighborhood, Costa has made the executive decision to avail his hypnotically delicious shawarmas to demanding customers every day of the week from afternoon to close, starting in the near future. Today, we're here to try the infamous chicken shawarma wrapped in massive sheets of Markouk bread delivered daily from Bistan Bakery in Montreal. Though along with Friday's falafel sandwiches, it's hard to ignore the other daily offerings encased in their gleaming glass cooler. Mediterranean wraps and salads made with red kale and chickpeas inspired by the healthy, light ingredients that Costa so reveres. 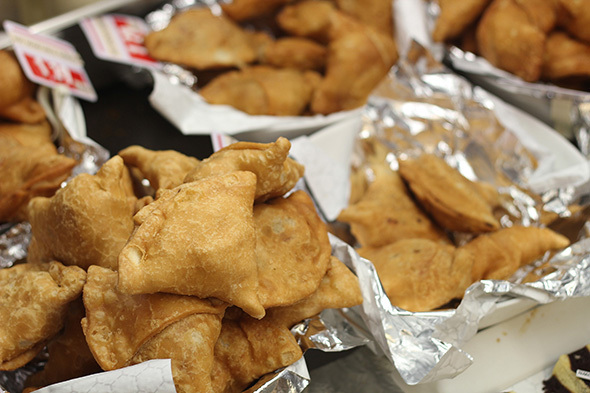 Indian roti and samosas made by some of his other chefs who hail from South Asia. Caribbean days with jerk chicken and Asian specials featuring pad thai - one could explore a new culinary culture at The Flaming Stove every day of the week. But I digress. As I said, we were here for the house specialty. As our mammoth sized wrap was being assembled all I kept hearing from the other hungry customers was how addicted they were to them. 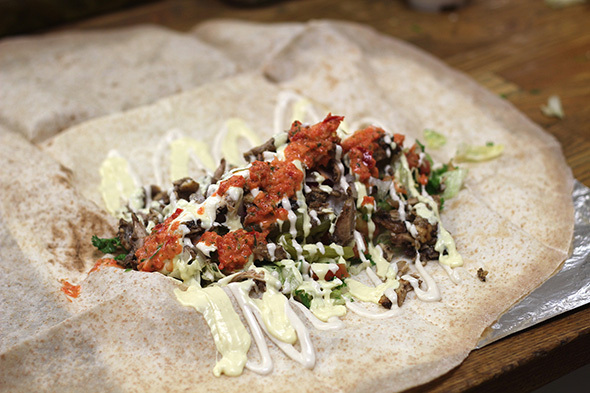 Toss in tomatoes and tabule, turnips, and pickles with the savoury shawarma, lace it with smooth balanced tahini and a special sauce called amba made from pickled mangoes, and then top it off with several hefty dollops of Costa's house made hot sauce and we're in business. 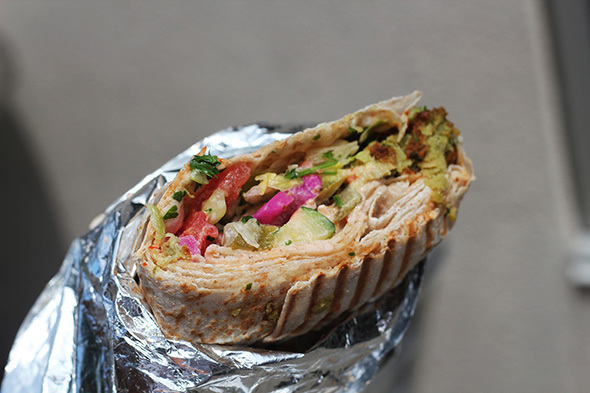 The falafel is paired with an assortment of roasted veggies - eggplant, red pepper, cauliflower, and zucchini - that add some unique depth and sweetness to the crisp, fragrant falafel balls. The fact that they are served cold doesn't even faze me, as the marrying of flavours work so well together. 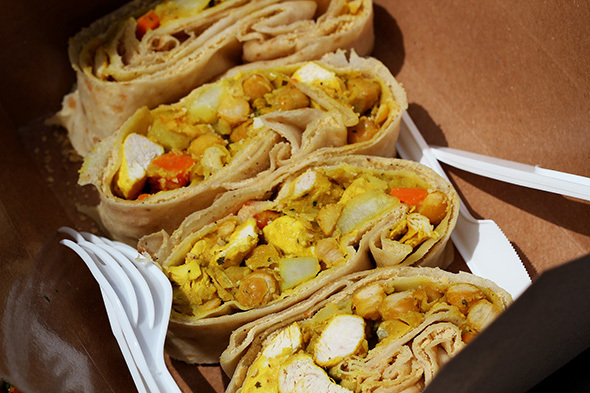 As a sauce fiend I felt as though the West Indian roti could have benefited from a liberal dousing in that department, but that was my only complaint of the afternoon. As I sipped on my fresh mango and pear juice from their healthy juice bar (cap off - the juice was too thick to waste my time with a straw) the sweetness of the beverage reflected that of the experience itself. Just remember to pay for your goodies up at the Hasty Mart cash - you might only forget the first time, as you'll undoubtedly be back again.